Have leftover chicken, but don’t know what to do with it? 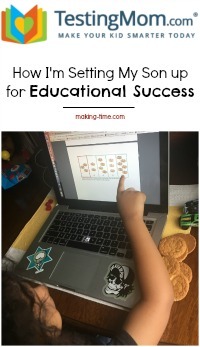 I have the perfect recipe for you! I don’t know about your family, but mine eats a lot of chicken. 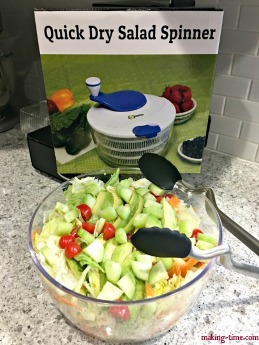 Quite frankly, it’s an affordable protein, and there are many different ways it can be cooked and a countless amount of flavors it can be enjoyed with. But sometimes we have leftover chicken and really don’t want the same thing two nights in a row. 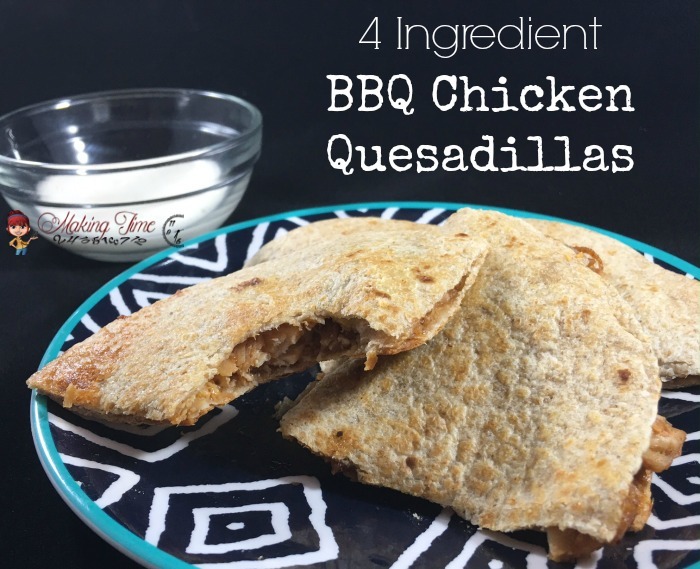 That’s when I turn to my easy 4 Ingredient BBQ Chicken Quesadilla recipe. 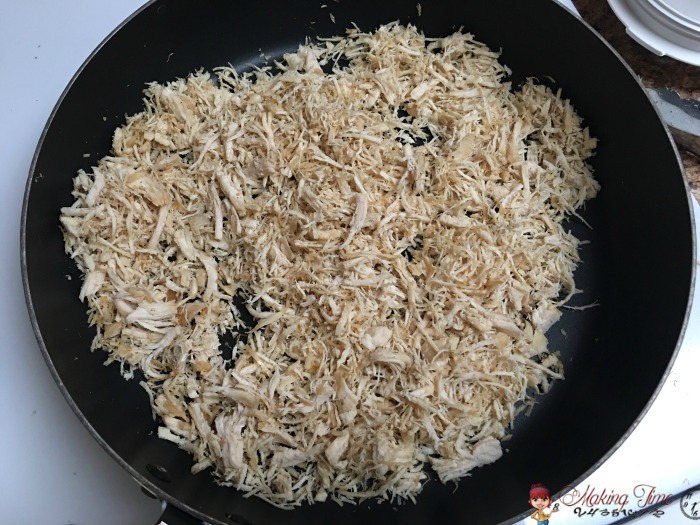 While these can be enjoyed as a first meal, it’s a big time saver for me when I make it using leftover chicken and it helps me minimize how much food we waste. 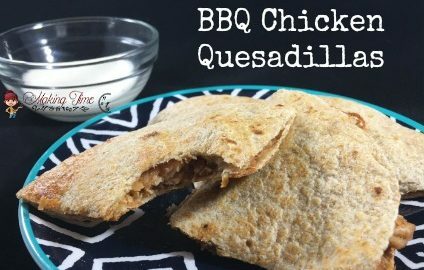 So today, rather than telling you what I’m making time for, I’m going to share my 4 Ingredient BBQ Chicken Quesadilla recipe. It’s something that saves me time and allows me to fit other important things into my busy day. In a blender, chop the leftover chicken breasts. Heat a skillet on medium-high heat, add a little olive oil and heat the chopped chicken. Transfer the warmed chicken to a bowl and mix in 1 cup of BBQ sauce. If you like a lot of BBQ sauce, feel free to add more. 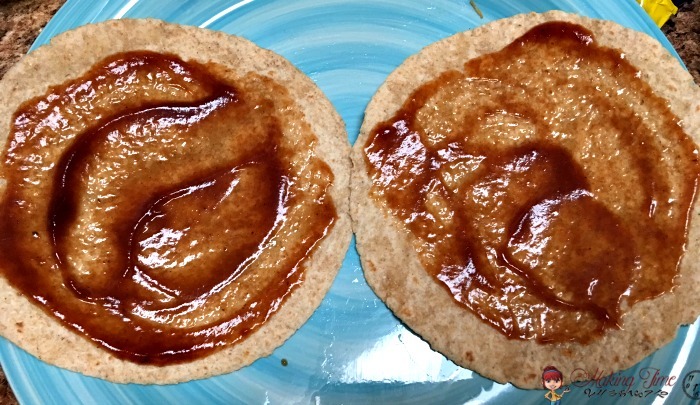 Taking 2 wheat tortillas, spoon some of the remaining BBQ sauce onto each and spread it around. Spoon some of the BBQ chicken mixture onto one of the tortillas. Don’t spread the chicken out to the edges because once the quesadilla is all cooked, when you cut it it will spread the interior ingredients towards the outer edge. 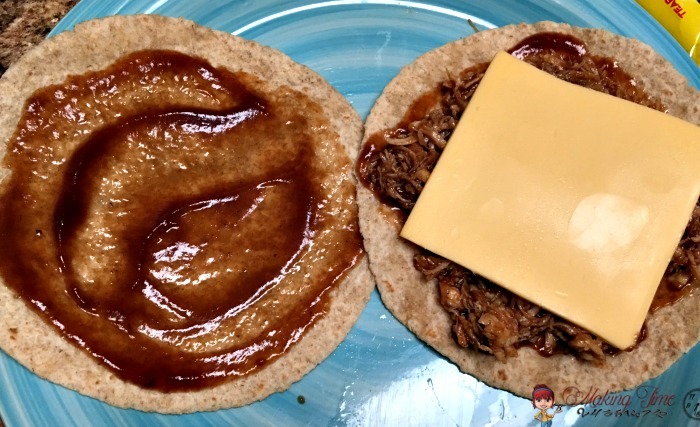 Place 1 slice of cheese on top of the BBQ chicken. You can also use shredded cheese if you prefer. My family is pretty basic and would rather have good ‘ol American sliced cheese. Place the second tortilla on top of the cheese. Spray the skillet with non-stick spray (I like to use olive oil spray) and heat on medium-high. Cook the quesadilla on both sides until golden brown. Let cool, cut into fours (I use a pizza cutter) and enjoy. *Note: You can also use the large tortillas. I have used them before and rather than using 2 tortillas to make a quesadilla, I simply fold the large tortilla in half. 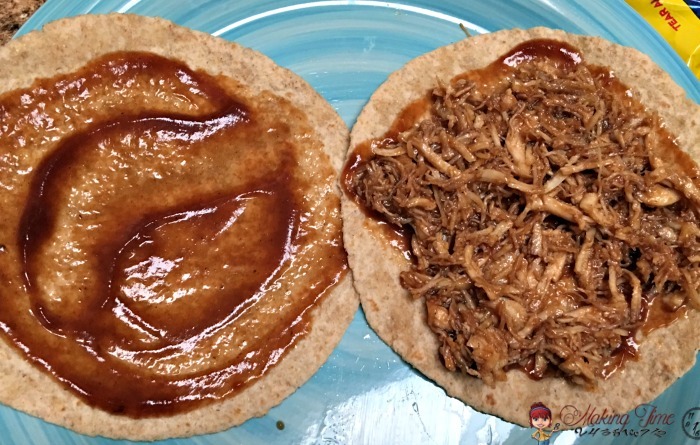 Just spread the BBQ sauce over the whole tortilla and then place the BBQ chicken mixture and cheese on only half of it. Then fold the other half over and cook. This recipe yields 8-10 quesadillas, all depending on how much filling you use. 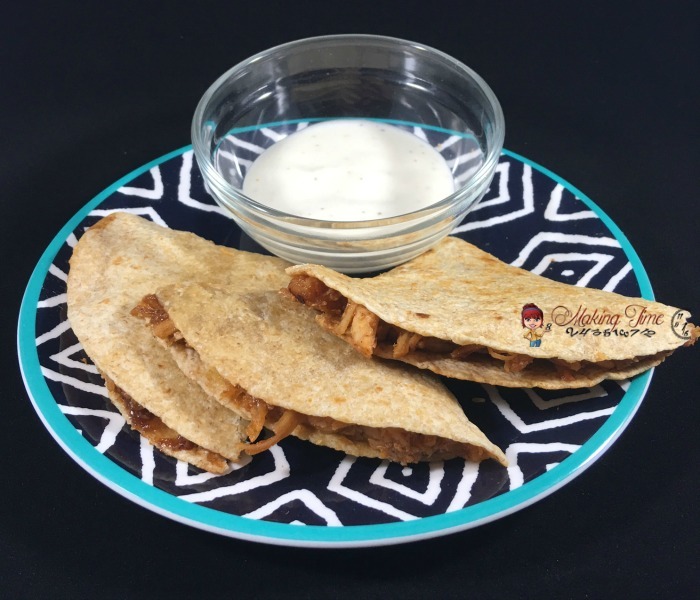 And as a finishing touch, I love to dip my BBQ Chicken Quesadillas in ranch dressing or even sour cream. Yum! Would you dip your BBQ Chicken Quesadillas? I make quesadillas out of all sorts of stuff. These look really good! I love making quesadillas for my family it is their favorite meal. We dip them in salsa, or sour cream! These look delicious! I’ve never had a quesadilla before, and never made them for my family. That needs to change. These look delicious! I do enjoy quesadillas but have never made them BBQ style before. I bet these would be delicious dipped in Ranch Dressing. Totally yummy! Oh, this looks yummy. I am hungry right now and I can eat tons of this!